I've been into knives ever since I can remember. 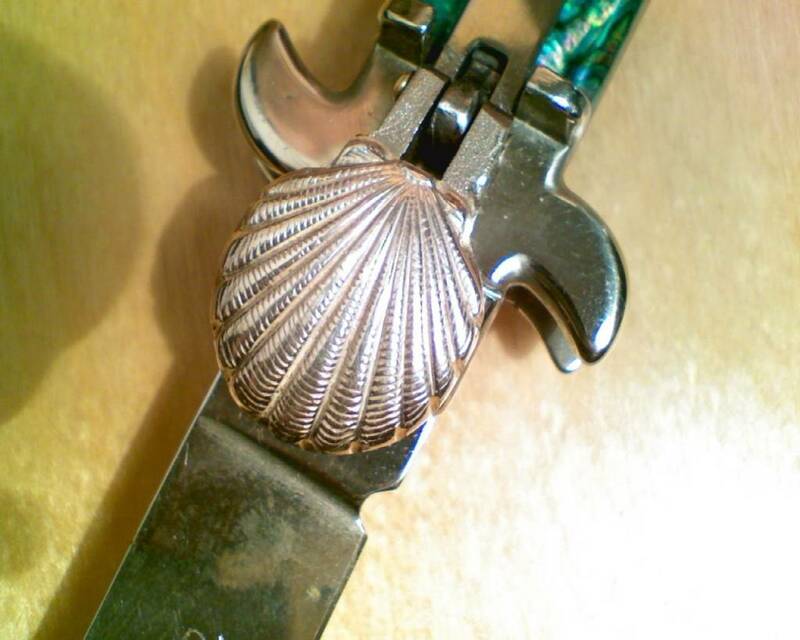 I was 4 when I can recall playing with my mom's key chain knife. I bought my 1st knife when I was 5 or 6 years old. Bazooka Bubble Gum offered a knife for .10 cents. I filled out the form mailed it with my dime and it arrived in the mail. It had blue scales and a cool blade. It was maybe 5" open. Fastforward to today I collect mostly Italian Stilettos in various styles. 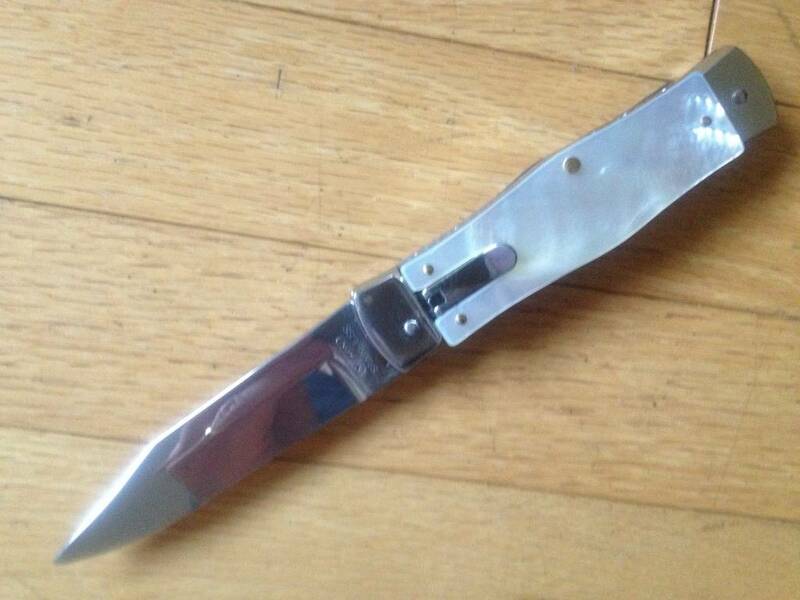 The classic picklock, swivel bolster, lock back, leverlock, OTF, Bolster relelase, BO/BC. Most of my knives are new I own several vintage knives. I need to grow my vintage collection. I also enjoy mangling. I have been customizing knives for just over a year. If you have any questions for me please send me a pm or post them here. I hope you like it. It's an awesome knife. 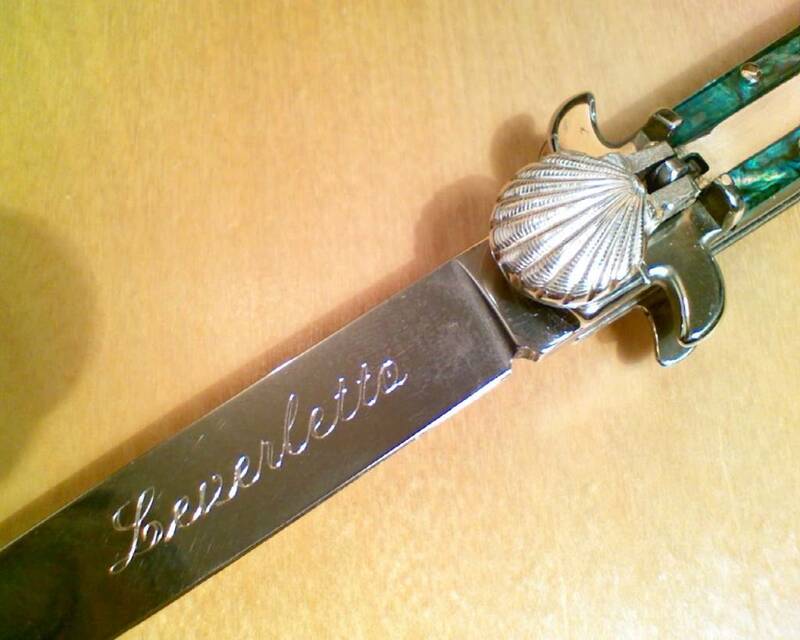 Stilettos are my favorite switchblade style. I just can't afford a good quality one... yet. My favorite is probably a bolster release. Something so simple yet beautiful about stilettos. Brings nostalgia and a rebellious attitude to mind. I hope you don't mind, but if you do just say so; I shortened your name to RNN. The swivel bolster was a great invention. No more broken nails or sore fingers. 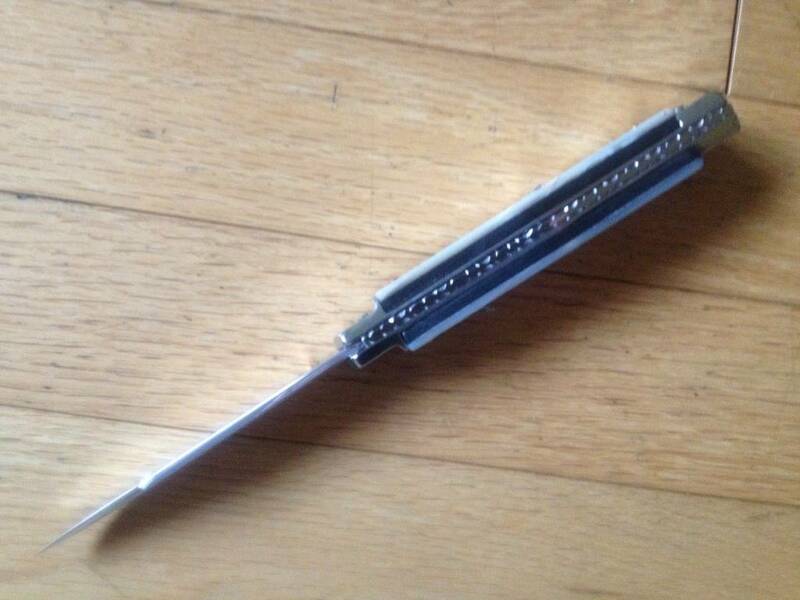 There are ways to make hard to release pick lock close, but it requires skill and the removal of metal. I'd like to recommend two makers of stilettos to you. Frank Beltrame and AGA Campolin three are two very well know craftsman who make some of the best Italian Stilettos. There are age restictions so before you buy check with your state laws. It's true these knives have an appeal all their own. Thank you for your friendly welcome. Lol age restrictions and I'm in Indiana It's not illegal if you don't get caught, right? What about AKC? Are they good? They are a bit cheaper than a FB, but you get what you pay for. I live on a farm and have owned knives since before kindergarten, sorta like you I guess. My dad usually signs the order form for me. He doesn't care, just says its my money. 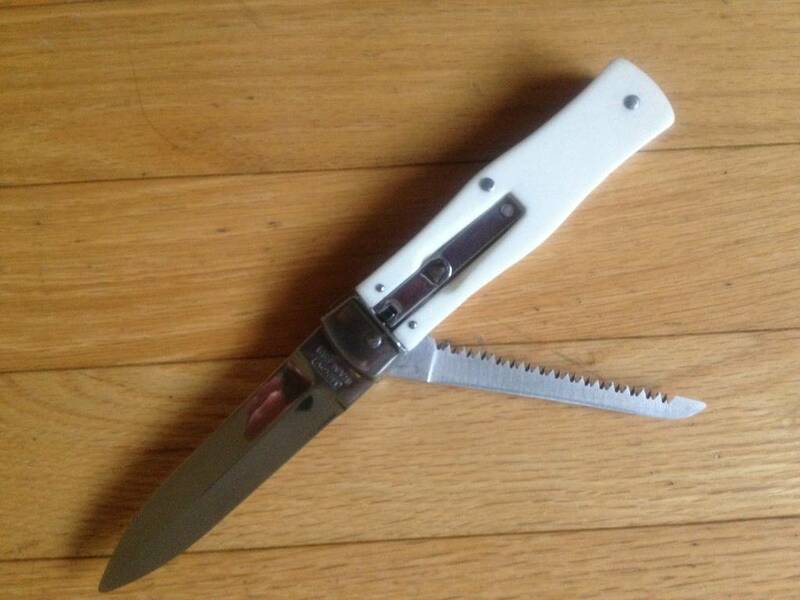 In fact, he his edc is a switchblade. 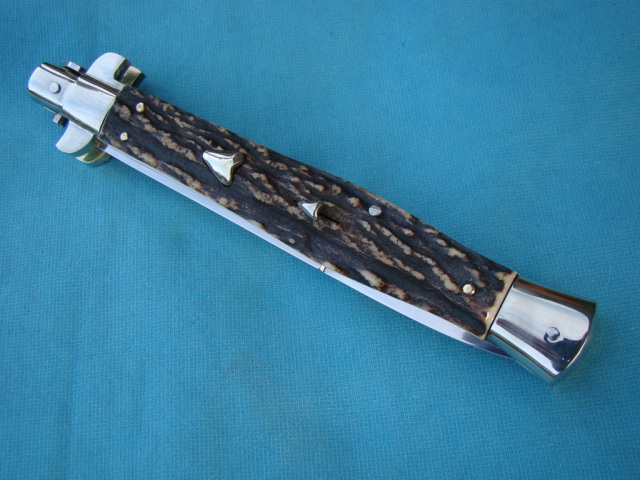 AKC is owned by the Camploin family as well as Falcon Kmives their non auto knives. If you're looking for a high end stiletto check out Due Buoi; they start at $240.00, but they are 99.999999999% perfect. I have the Thorn; it's wicked cool! They do have a low end model. It cost $79.00; I just bought one a few days ago I'm thinking it must be as good as or better than any mass manufactured production model made by Frank B or Campolin or SKM. Their's a bill in your state sponsored by you senator to amend the knife laws in your state. Check this out kniferights. org. I live in MA. The knife laws here are bad too. What type of knife does your Dad carry? What's you favorite knife or knives? My wish list has a Burm and a Havlin on it. I have assemble many Mikvos. I love the knife. It's well made and an excellent worker knife. 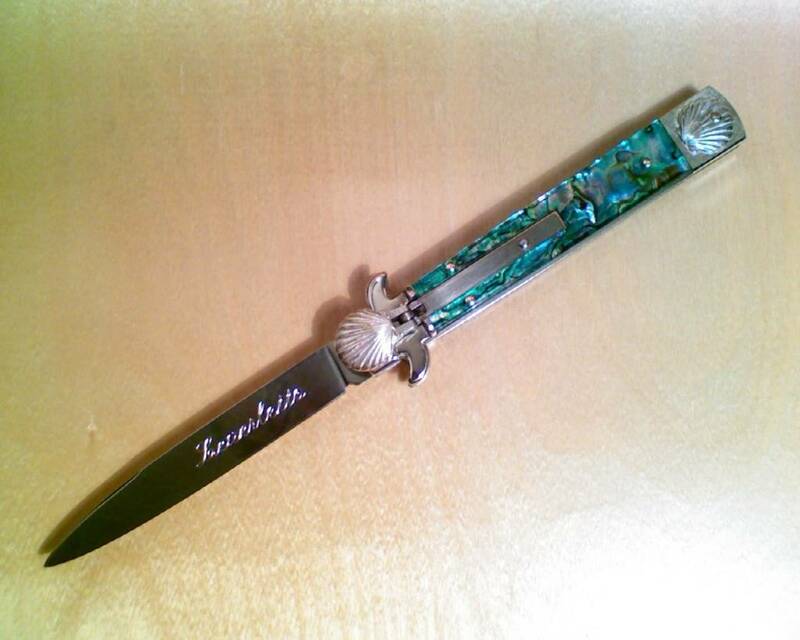 The Italian Stiletto's are not the best worker type knife. Go with the Mikov Kit. Tell David hello from me; he's a really cool guy. This is his website: mikovknives. You send payment by PayPal. He ships same or next day by registered mail; you'll have to sign for the package or go pick it up at the PO. I usually takes about 8 to 10 days for the package to arrive. The blade are 100% dull; you'll have to sharpen it. I like the clip point blade, but it's my personal preference. 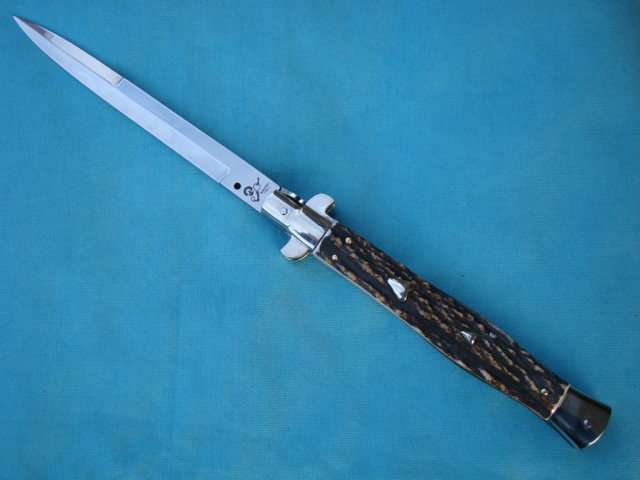 The dagger blade is awesome too. Here are a few that I put together. I've done Ram's horn and jigged buffalo to look like Impala. Italian stiletto's make great show pieces and the look cool when you cut your apple or other fruit; I don't recommend them as a working mans knife. Let me know what you decide and don't for get to show me a photo of the one you choose. I love photo's. Curly maple handles. Should I get that or spend the extra $ to get one from Mikovknives? Josh at PVK is another good guy to do business with. He stands behind his products. The good thing is he's here in the USA. His place of business is in MA about 100 miles from my home. I have purchased kits from PVK and other knives. The cost is the same from David or Josh. The only difference is the color of the metal used to move the lever up and down. 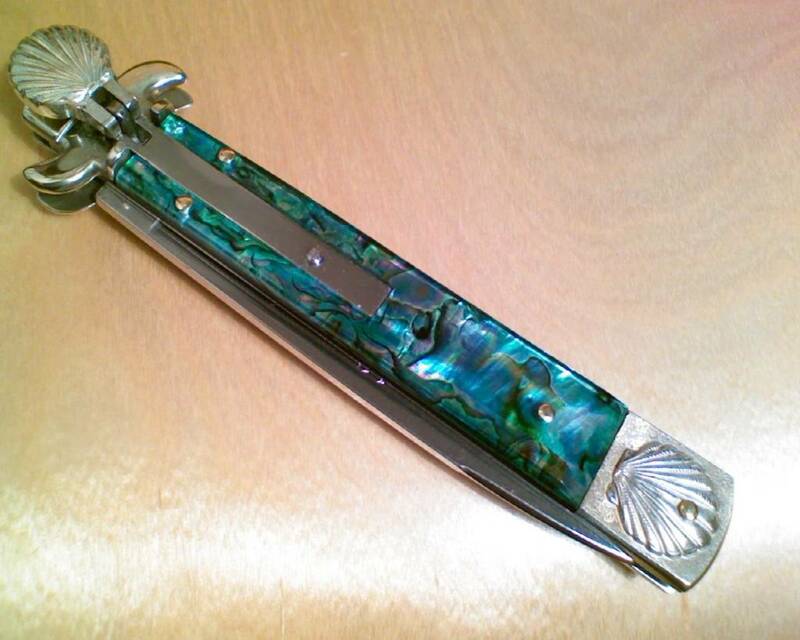 PVK is blue and Mikov from Europe is highly mirror polished stainless. The other reason to buy from Mikov direct is the selection. PVK only has that one style. If you plan to expose the spring the get it from Europe; if not, get it from PVK. You'll get it faster, you won't have to sign for it, shipping is less expensive and the quality is exactly the same. Are the scales pre-cut? You can get them pre-cut and that saves a lot of time, but I like to make my own. 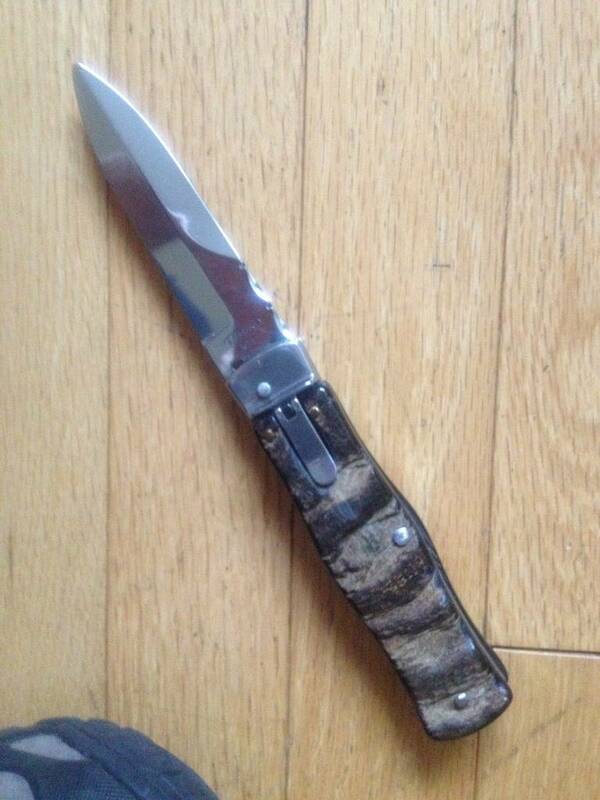 I have a lot of fun making the handles and I can customize my knife with any kind of handle. You can make your handle from wood you already have at home or if you have cow horns you can flatten them and make your own horn handle. Do you hunt? Do you have any deer horn? Stag handles look awesome on a Mikov. They look awesome on any knife. I buy all of my scale material. 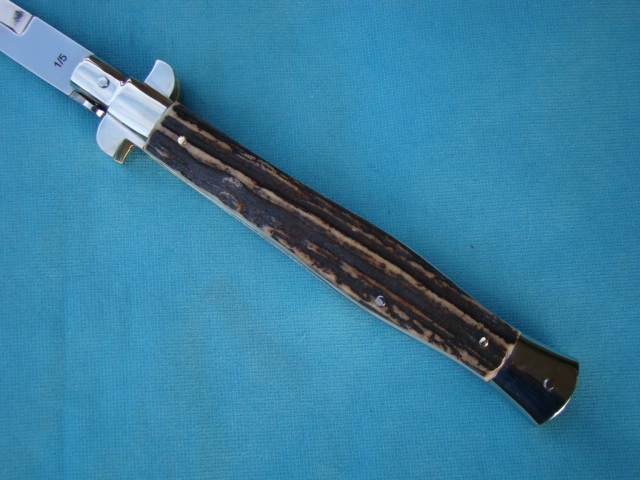 There are a lot of places on line to buy all kinds of knife making supplies. If you have any questions please ask away. If I can help, I will. Oh, the blade from PVK is dull you'll have to sharpen it too. I suggest to build the knife first and then put the edge on the blade. I forgot to mention some of the lever's spring will be exposed. You have to cut some of the scale material away. It's just how it is. The blue really isn't bad. It's a matter of personal taste. Yes, I am a member of SharperDeals and TalkBlade and a few others. Eastcostsniper on TB or Kruznn on SD has some great tutorials you should check them out. I can't wait to see your finished knife. It's not a pressure fit you'll have to pein it. I just started doing this procedure that I'm about to explain. Before I would insert the pin into the pivot hole and pein both sides, front and back, very carefully. Now, I pein one end of the pin before I put it in the pivot hole. First, I file it to a point and then with my 2 ounce Ball Pein hammer. I use a 2 ounce hammer for a few reasons, 1. a professional suggested it, 2. the head is small, so there is less chance of doing damage to your knife, and 3. it's not heavy, a large heavy hammer can do some serious damage if you should miss. If you don't have a two ounce hammer. I suggest buying one. You can get an inexpensive hammer for under $5.00 plus shipping at Otto Frei Part No. : 137.112 this is the one I use and it's awesome. I gently tap tap tap tap tap till I have a nice round head. Then, I gently file it to make it smooth so it looks good. I try to get rid of any rough edges. Next, I insert the pin with the peined end into the lever side of the Mikov. There isn't much space to pein the pin on the lever side and since it is the front of the knife I want it to look its best. Next, I cut it down so that is no more than a 1/16 of and inch on the back side. I file it to a point and then with my 2 ounce Ball Pein hammer I gently tap tap tap tap tap till I have a nice round head or something that looks good. Sometimes I can't get it round, so I leave well enough alone. Every time I try to make it better I mess it up. You don't have much space to pein. There's the ridge of the bolster and I try not to hit it so I tap slowly and gently. I also, tape the bolster to help protect it from scratches. I use a thick duct tape. I cut a small hole so I can see the pin. In fact I use masking tape on the blade to protect it. 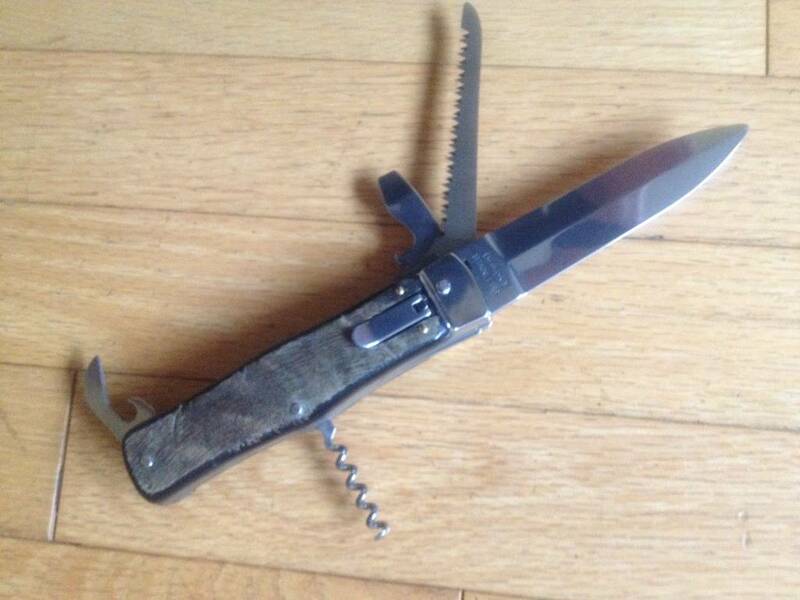 You'll want pivot pin tight, but obviously not too tight because it will interfere with the opening of the knife. Too loose and the blade will move left to right and you want to avoid that too. If it's loose gently tap some more. I stop and check many times this method will almost always prevent peining your pin to tightly, but if you do over pein and the blade will not open first oil the blade and pivot pin or use some type of grease work it in and that should do it. If oil/grease doesn't work take a flat/slotted screw driver and very very gently put as close as you can to the pivot pin and twist ever so gently. You may want to use some tape on the screw driver to help prevent scratches. Fire the knife if works fine leave it alone. If not, twist again very very gently till it works like it should. Some additional advice: work slowly. Do not rush your project. Stop when your tired. If things aren't working out stop rest go back to it another day. Be very very patient. And work slowly. Do not rush your project. Stop when your tired. If things aren't working out stop rest go back to it another day. Be very very patient. I have messed up more times than I care to admit for not following my own advice. Let me know what Bill suggests. Thanks for the advice... again. 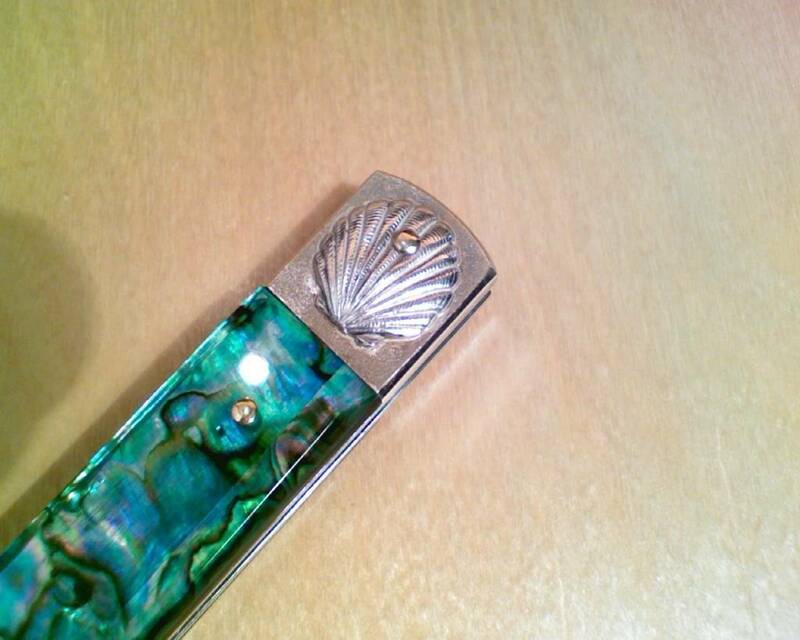 I had read to use a flat end punch to pein the second side, but that would require someone hold the knife for me. I saw that leverletto on SD, but I had no idea you were the proud owner. Lucky man. I'm not a member of the knife101 forums, so do you think I could just pm him on SD? Sure pm him I do all the time or you can ask the question on the SD forum under the section Ask Bill DeShivs in the General Questions tab. Asking in the forum others may see your question and give you their opinion. I have often asked questions and the more who see it the more answers I get with different options to do the same operation. Sometimes more is better; I like options. I can try the one I feel more comfortable doing or I may not have the tools for option A, but I may the the tool for option B. In other words there is more than one way to do the same thing. Go for it. I suggest using the General Question tab. What's your screen name on SD? Already got one reply! I'm sure you'll get Bill's input soon. My screen name on SD is the same as it is here "john6553" on TalkBlade I'm just "John" with no numbers. Location : Not where I'm supposed to be! Glad to see ya found my suggestion inspirational enough to join up. I've not been hanging out here much, as I need a lot a materials before I start mangling/crafting. Oh, that Delta-tab/button! The missus asks me who I'm wet-dreaming about, I don't dare tell her it's a knife! "Of course honey-it's you" Have you seen the "AK47" plans? Maybe we could chuck in together one day & get the necessary bits & pieces? I haven't had much time to go exploring the forum's various and interesting topics. I have to as they say Just Do It. I haven't seen the plans for the AK; I'll have to check that out. I'm planning to shot a pictorial of my Delta today and maybe by this evening I'll post it on SD, TB, WS a few others and here the only thing that could foul up my plans is me. The Delta Stag has wicked cool Sambar Stag scales. 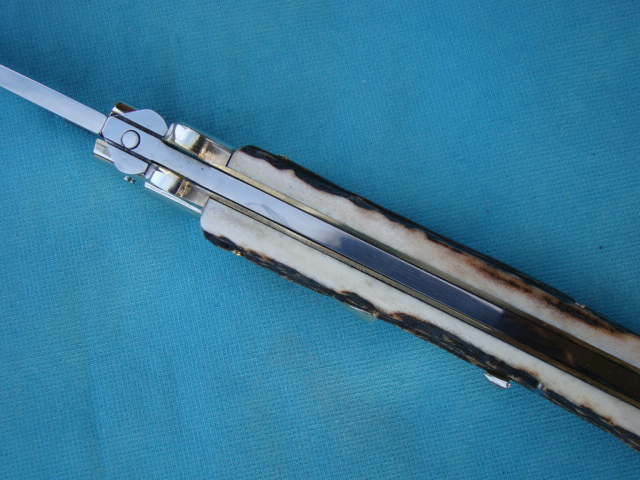 Every thing that Pascotto makes is made with museum quality scales. How is the Mikov coming along? Did you get the kit? Let me know if you need and help I just may have the answer and if not I'll try to get you one. When you have a chance "Introduce Yourself" to the SD forum and don't be a stranger, if you already did I guess I missed. Check in leave a comment join in the conversation. I should take my own advice and spend some time here on Sinza. I haven't got the kit yet. I've been kinda busy with some trades. I traded a bow to have someone forge a big bowie-camp knife out of 5160, I'm in the process of trading a flint knife I made for a handmade steel one, and I need to get some cattle horns out in the mail. And I have been meaning to introduce myself on SD but every time I get online I forget. I think I will do that right now. Sounds like you have been busy. The horns you're mailing are they from cattle that you own? If I have time, I plan on posting the Delta Sambar Stag on the SD forum later tonight. They were from a Jersey heifer we dehorned so the horns were only about 3" long. Not big enough for knife handles but big enough for bow nock overlays. I love the Delta!! I hope to someday own something that nice. Last Saturday was my b-day so I got a little cash. Probably end up with a Mikov sometime.... still trying to decide. Depends on how you plan to use your knife. The mikov is a bigger more heavy duty knife. The leverletto is smaller so it's still a great knife, but not as beefy. The Mikov weighs more and has a larger profile in your pocket. The LeverLetto is lighter and takes less space in your pocket. Both have the same type of firing mechanism; both lock up nice and tight. It just depends on your personal preference. What I suggest is getting one of each. I may have a Mikov that I can sell you for $40. plus shipping. It's like six dollars total $46. I'll check my stash of knives and I'll let you know what I have. I'll send you a PM with a photo maybe later tonight or tomorrow.